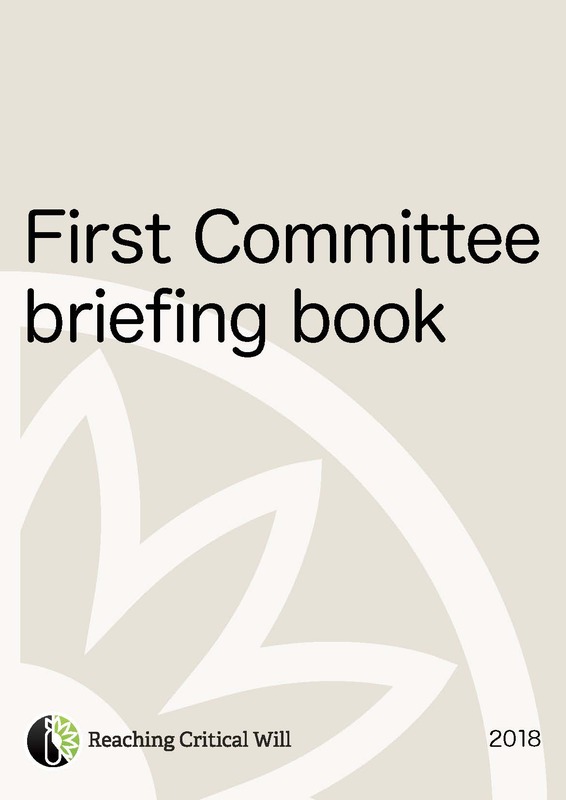 First Committee 2018 briefing book now available! Published ahead of the 2018 UN General Assembly First Committee, this briefing book highlights a number of critical disarmament topics and suggests how governments can achieve progress. The General Assembly's work on disarmament is conducted through its First Committee. This briefing book provides a quick overview of the state of play on some of the most pressing issues that will be addressed at this year’s First Committee. It also outlines recommendations for governments from some of the key civil society groups working on these topics. The civil society organisations, coalitions, and campaigns participating most actively at First Committee have argued consistently that we can and must replace watered-down outcomes with real results that advance human security and social and economic justice. We are delighted to offer the online version of this publication for free, but please consider making a donation to Reaching Critical Will to help us cover the costs of producing this book and the other materials and information services that Reaching Critical Will provides.